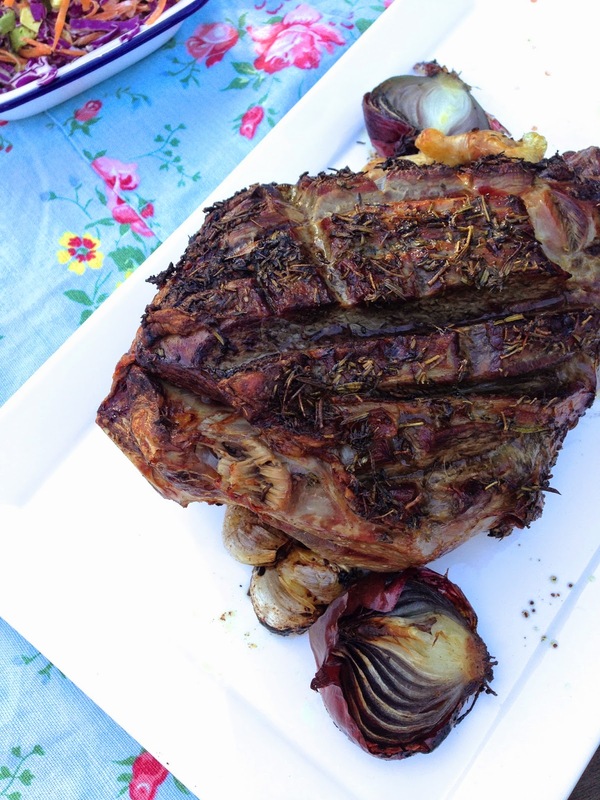 It's been quite a while since my last recipe post and so I thought being the weekend I would share this amazingly delicious Roast Lamb!!! I stumbled across this Jamie Oliver recipe a few months ago in the weekend paper. Its been cooked many times over since then because it seriously is so easy and delicious. 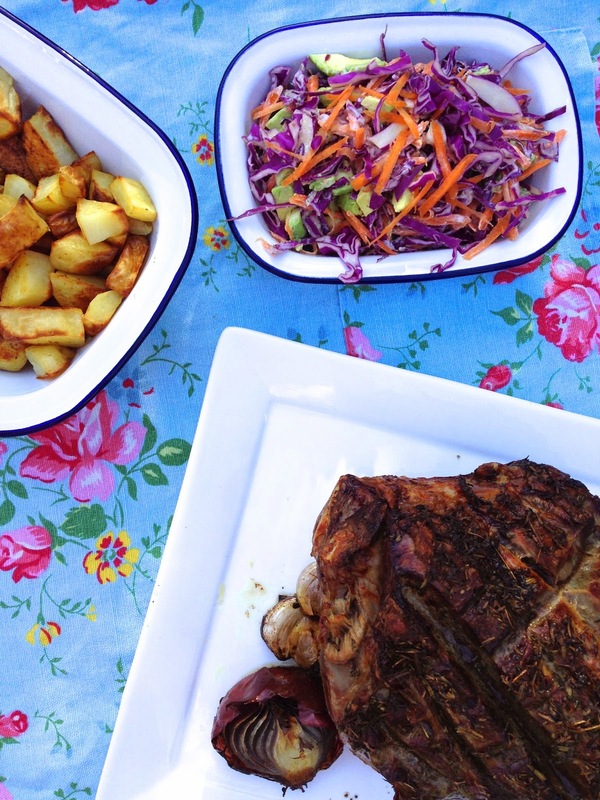 I also love that it can be served with a trayful of roasted golden veggies or with a simple salad. Preheat your oven to 220 deg celcius. Score the lamb all over 1/2 cm apart and about 3mm deep- like you would with a ham! Make a herb butter by popping the butter, thyme and rosemary into a blender and whizzing well to combine. Season with some salt and pepper. I also cheat by chopping herbs finely then using hands mix into butter. The messier option, but less washing up and still effective! Arrange the red onions and garlic cloves in a large roasting tray. Place lamb on veggies in tray then rub the herb butter generously all over the top of the lamb. Put into oven to cook until meat is to your liking. Jamie's tip for 'blushing' meat is roasting 10 minutes for each 450g, plus an extra 20 minutes at the end. When lamb is cooked, allow another 10-20 minutes to rest. Based on these times, our 2.5kg roast needed an hour and ten minutes in the oven and extra time for resting. The suggested side for this dish was a celeriac mash and a heavenly gravy. I tried the gravy and it was, hands down, the best gravy I have ever made. Can highly recommend. Drain any 'fat' or 'oil' from the roasting tray, leaving onion and garlic remnants and other meaty bits. Squish the onion and garlic into the tray. Sprinkle 3 tablespoons of gravy over the tray, mixing and coating the onions and garlic. Pour in a 'glug' of port and a litre of hot chicken stock. Place on high heat and mix so that it is well combined. Keep stirring, allowing gravy to reduce. Pour through a sieve if needed, however, my gravy turned out so smooth and flavoursome. Please note- I have also made without Port and still tastes good. Otherwise, I served ours with some roasted Potatoes and a simple slaw made up of red cabbage, carrot and avocado lightly coated with some aioli mayo and some home made mint sauce. With winter now officially done and dusted (with the exception of a few days here and there!) and the pretty blossoms of spring still popping up all over the place, its once again a good excuse to open the windows, move some furniture around and add some fresh fun colour to your home. 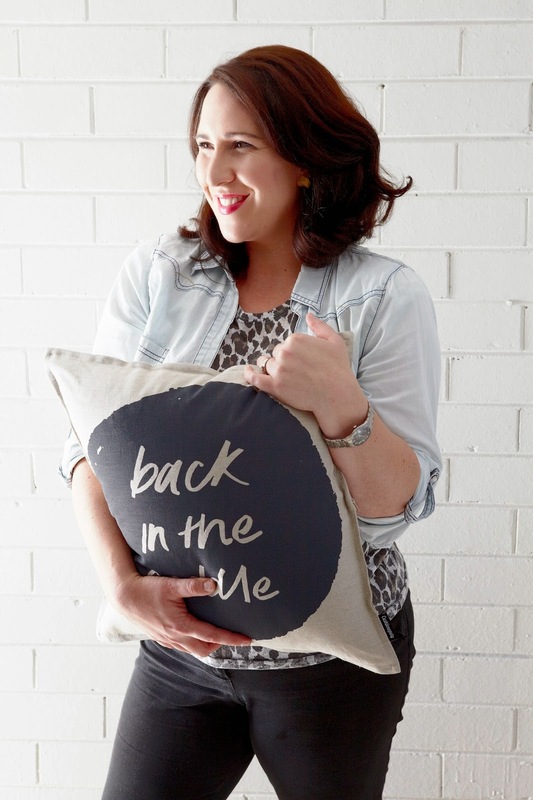 Today in our catching up with series, Im excited to have Zoe Howard, founder and creator of one of Australia's up and coming interior homewares business, Cushionopoly. Cushionopoly is an Australian owned business proudly located in Melbourne. 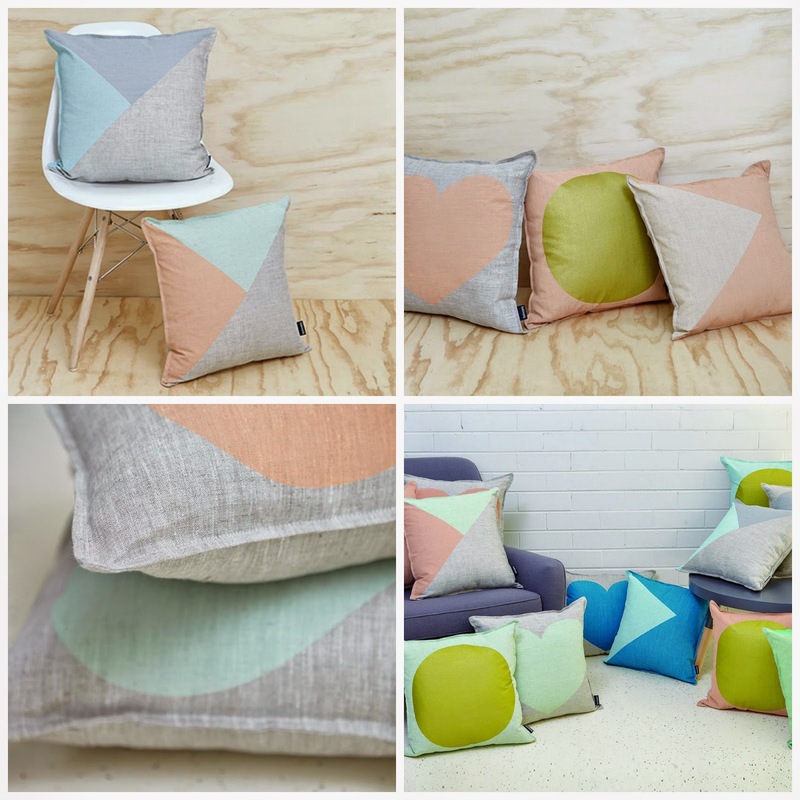 Zoe's designs are fresh, fun, affordable and becoming very popular (you may have seen some of her cushions in the Block Shop!) . I love the combination of a gorgeous classic linen fabric with a contemporary feel of the colour and pattern range. So, without wasting any more of your precious time, here is lovely Zoe, sharing withus a bit about herself and her wonderful business. 1. A quick summary about you and why you started Cushionopoly. I grew up in a beachside suburb in Perth, one of four kids – middle child. While studying for my journalism degree I worked at a newspaper in media sales which saw me fall into a career of advertising media sales instead. My passion for travel kicked in and saw me travel to London for a stint of work and play. My husband and I met while working at a magazine which was popular for travelling Australians and New Zealanders – TNT Magazine. After a bit more travel we ended up moving to Melbourne in 2005 and I moved into marketing. Three years ago after the birth of my son Gus, I was off on maternity leave for 12 months. Naturally being a first time mother I spent a great deal of time at home with much of it staring at all the improvements I wanted to make (ours was a renovators delight!). Unfortunately being on one wage for a year my budget was somewhat lacking. Being a homewares nut this did make me very frustrated and I looked to simple ways to make updates. So I started out trying to source cushion covers as this was the easiest, most affordable and environmentally friendly way to update what I already had. I looked high and low and just couldn’t find the style, colour or range I had in my head. Everything was way too expensive or the quality wasn’t there. My mother-in-law is a keen crafter and she helped me re-establish my sewing skills and I started making my own. When friends would come around to visit they would comment on the cushions and couldn’t believe that I had made them myself. A few friends put in custom orders! So when Gus was about six months old I started to put a plan in place to build on this idea of creating handmade, beautiful and fun cushions but making them affordable too. I would say my style is vibrant and fun with clean and simple designs that catch the eye and bring a smile to the room. My day starts when Gus wakes up somewhere between 5am – 6am and then he gets into bed with me for a cuddle while I check out instagram J then it is dropping off Gus to daycare (he is in three days), going to the post office and sending off the previous days orders. I usually drop in and grab a takeaway coffee (sometimes a morning treat) from my favourite local café Pure Italian and then it is back to the studio and I begin to go through my emails and orders and get back to new stockists and plan any social media I might be putting up that day. Lunch is whatever is in the fridge and then usually wait around for couriers to pick up wholesale orders in the afternoon while ordering supplies, working on any new designs and sewing up cushions. Then back to pick up Gus and get dinner started. 4. Favourite designers you take inspiration from? I work in a very inspiring community of people from fellow designers, makers, crafters, bloggers and instagrammers. I take inspiration froma so many places and images its almost impossible not to these days. 5.The room you love most in your home? I love my kitchen! We have renovated our 1960s home over the past year and we went for almost seven weeks without a kitchen (those of you who have kids you might understand that being without a kitchen, especially a sink, is a special kind of hell). So when it was finally installed I have never been more in love with a space then my new kitchen. Close second is my living room which does get all new cushions on the couch probably every three months. Tea definitely! My mum is British so I grew up always starting the day with a cup of fresh brewed tea (no tea bags for my mum and dad!). I love love love Earl Grey tea strong with a dash of milk. 7. What do you love most about having your own business? I love the idea and feeling of endless opportunity and a sense of freedom to my life. To be able to get out of your business the hard work I put in is so very rewarding. My favourite country destination is Tasmania. My in-laws are poppy and sheep farmers from Cressy just out of Launceston. I spend a lot of my holidays in Tasmania and even launched my first screen printed range The Dark Horse there at Agfest. 9. Favourite colour combinations at the moment? Peach and mint! It feels so fresh and summery. 10. Three items you can't currently live without? A very big thank you for Zoe popping by and sharing with us her wonderful business. All images courtesy of Cushionopoly. 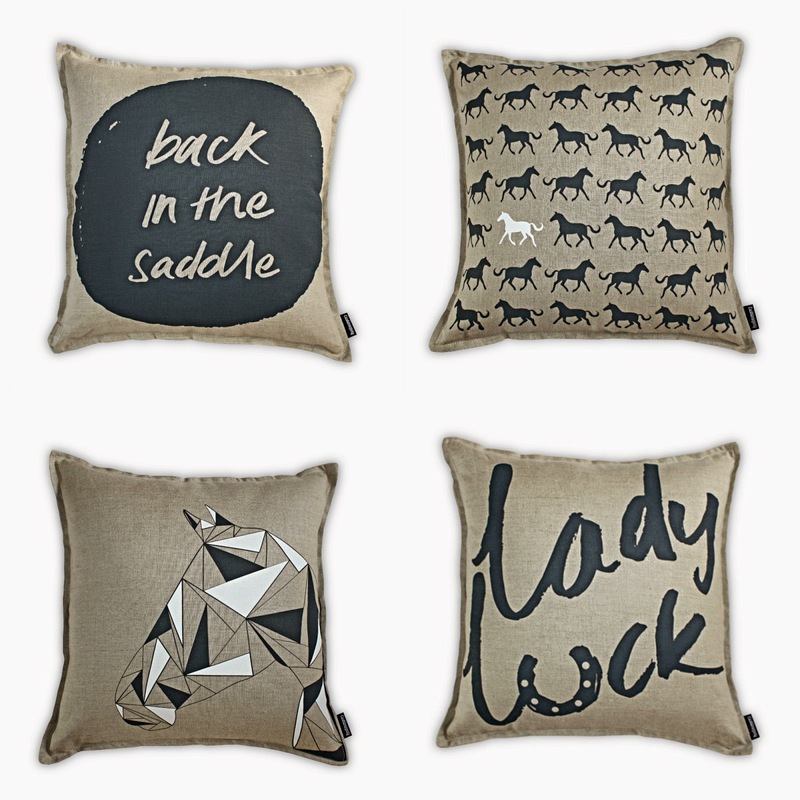 And if your having a spring cleaning moment and looking for a easy, affordable and cheerful room makeover, click over to Cushionopoly's online store and check out their gorgeous cushion's. You can also find them at the Finders Keepers Markets in Melbourne held tonight and tomorrow. Stay up to date by following on Instagram (@cushionopoly) and on Facebook. 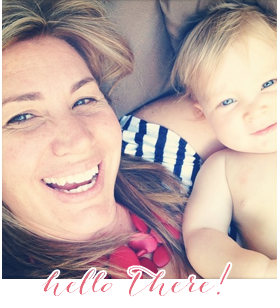 So, Im back again….this time with a glass of champagne in hand as I type. Why, you may ask??? Well this afternoon I finally launched my new business- Pink Paddock Store. Today has been filled with mixed emotions…stressed and anxious trying to get website finished, tired from a late night sorting and packaging cards, nervous about pressing that go LIVE button on site, and then extreme excitement as my first order came through only 20 minutes later! And not from a family member or friend either, I might add. Although I now consider Erin a good friend! Thank you Erin!! But some info on Pink Paddock Store….. Pink Paddock Store is a small boutique online stationery store, selling gift cards designed by me and printed by one of our local (and amazing) printers! Im proud to have a product that is made in rural Australia and supports local industry. The current range is small and new designs will be added in the next few weeks. I also will have gift tags and (dare I say….) Christmas cards arriving soon too! My aim is to beable to stock a good all round range that enables 'one stop' shopping and where you can browse through and find something that suits. I also want them to be colourful and fun! Afterall, receiving a card in the post always makes one smile! Deer Friends are we…..found here. Thank you Boxed Set…found here. The boxed sets are great value and will mean your stationery cupboard is stocked. 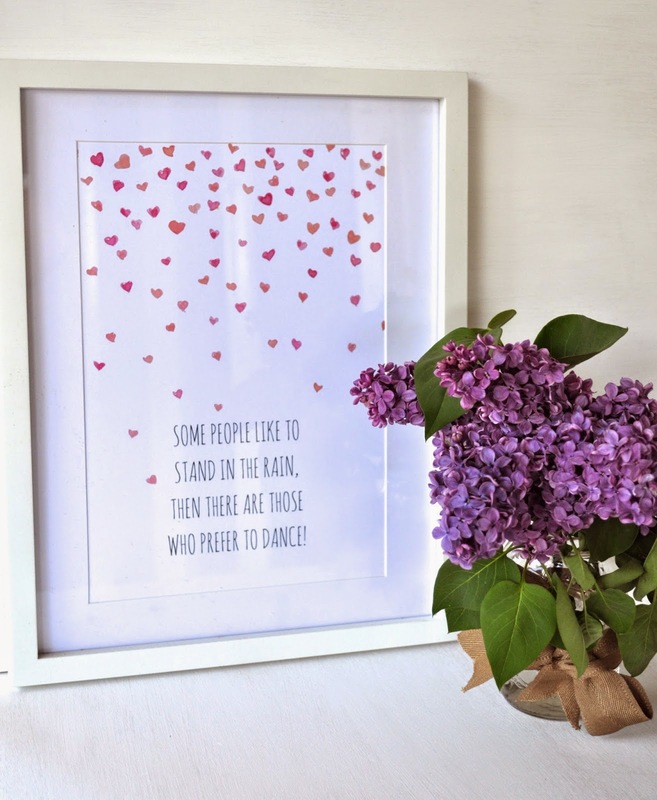 I also love that they can be framed as well or just simply taped on the wall next to your computer for some fun and inspiration! 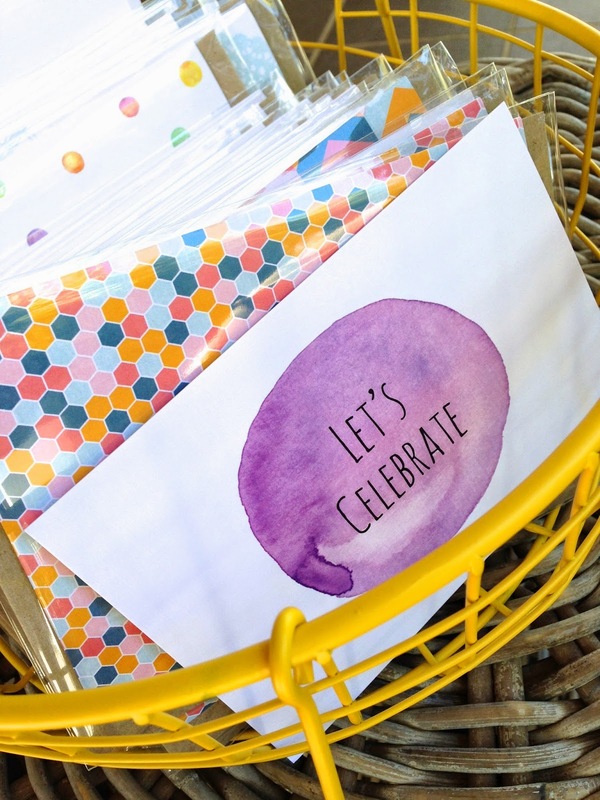 Happy Spots postcard Pack…found here. So, if you are a paper lover like me, and have a spare moment…I would love for you to pop over and visit my new store. There are some individual cards available, as well as postcards, box sets and some A4 Prints. Im also running a Promo until next Sunday the 19th October, 2014. All online purchases over $30 will receive a free A4 print (valued at $14.95). Conditions Apply- only valid for Australian postal addresses and the print is one pictured and is unframed. Thank you Floral Wreath Card found here and box set here. If you would like to stay up to date with any Pink Paddock Store news you can follow me on Facebook and Instagram. And if you feel like some online shopping this weekend I would love you to stop by!!! Sharing the love…Donna Hay's Pear, Yoghurt & Chia Muffins!